Opening Hours: Monday to Friday 8 am-5 pm, Sat-Sun 10 am - 5 pm, 24/7 emergency service. Since 1950, the Ogden Clinic has been working hard to meet the ever changing healthcare needs of Ogden area families. We offer more healthcare providers in more specialties at more locations and we accept more insurance plans than any other clinic in Weber County. If access to quality care and providers is what you need, then Ogden Clinic is the place for you and your family. We specialize in the following areas, Hand Surgery, Orthopedics, Physical Therapy, Podiatry, and Urology. 24/7 Emergency service. Service: Hand Surgery, Orthopedics, Physical Therapy, Podiatry, Urology,Urgent care, Family Medicine Practice, General Surgery, Neurology, Dermatology, Audiology, Allergy, Ear Nose and Throat, Nutrition Specialist, Pediatrics, Child care Doctors, Speech Pathology. Multi-specialty Clinic, Outpatient Clinic, Fellowship Trained Specialist, Specialty Care, Dermatology, Upper Extremity, Women’s Health, Ob/Gyn, Sleep Disorders, EEG, EMG, Skin Cancer, Mohs Surgery, Medical Dermatology, Allergy Shots/Allergy Testing, Balloon Sinuplasty, Prostate Cancer, PSA, Radiology – mammograms, CT Scans, MRI, Fluoroscopy, fine needle biopsies, DEXA scan, Colonoscopy, Colon Cancer, Breast Cancer, Skin Rejuvenation, Dermal Fillers, Highlighted area denotes high profitability, department/service, Varicose Veins/Vein Ablation, Gastroenterology, Erectile Dysfunction, Plastic Surgery, Breast Reconstruction, Nutritionist, Diabetes Counseling, Pregnancy, Sterilization - male and female, Vasectomies. 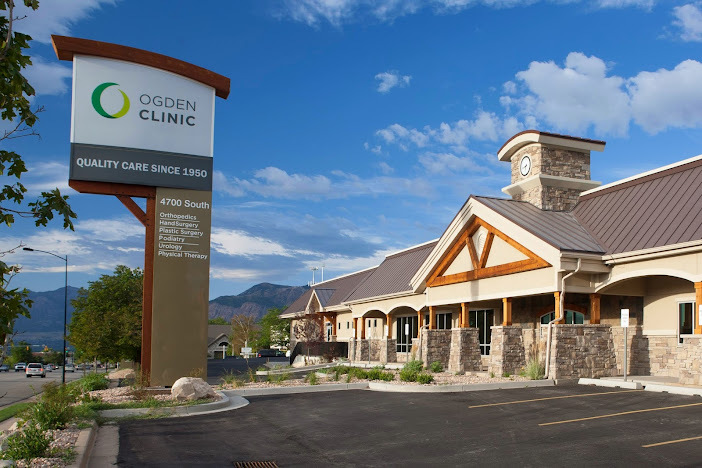 Had a great experience dealing with Ogden Clinic Professional Center South? Share how great it was. Owner of Ogden Clinic Professional Center South? Click here to edit or enhance this listing.